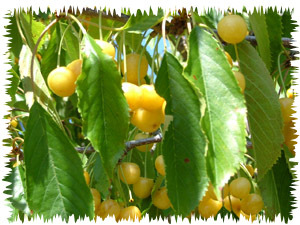 Ever wonder where maraschino cherries come from? The sickly sweet, almond-flavored ornaments don’t grow on the tree that way. They don’t taste that way in nature, either. Actually, they’re much better right off the tree, minus the artificial red or green coloring and various assorted chemicals. They’re very sweet, just like the larger black cherries, but with a flavor all their own — almost with a hint of banana or something. These luscious treats are dumped in a pit (the one I’ve seen is about the size of a motel swimming pool) filled with a brine of alcohol or sulfur dioxide. The color is bleached completely out, then they’re dyed and artificially flavored. I haven’t eaten a single one since I saw how they’re made. I do, however, enjoy the real thing. This afternoon, I skipped lunch to save room for fruit as I picked in the orchards. My two weeks on the farm is at an end, but as always, I wish I could live this way more of the time. The fresh air, exercise, and fresh foods are inherently healthier, but too often so hard to obtain in the hustle and bustle of ordinary life. As summer comes to a close, I’m going to try to incorporate more of these things into our lives. Hunting Island State Park in South Carolina is amazingly beautiful, unbelievably affordable, and just a day’s drive from home. Spring Break didn’t quite go as originally planned, with Beta bailing out on us due to a nebulous rugby schedule (they’re playing in the southeast quarterfinals tomorrow, as it turns out), then Alpha electing to stay home because she fell ill the day before we left… but we still had a fabulous trip with the younger two and the dog. The campsites are large — at least double the size of those found in most state park campgrounds, and probably four times the size of commercial campsites. 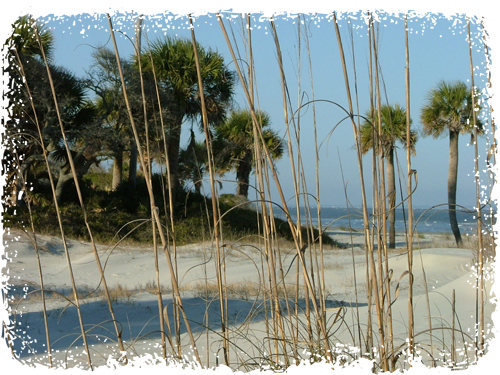 Nestled behind the dunes in a forest of palmetto and live oak trees, we went to sleep each night listening to the ocean. There was no internet, no tv, no newspaper or radio. There were books, and lots of family time. We rode bicycles on the beach, walked on the boardwalk through the salt marsh, and laughed at the antics of the raccoons that invaded every night. We bought fresh seafood, and grilled it on the fire. Never has one week passed so quickly. O, the weather outside is frightful… dreary, rainy, and just useless. Six days before Christmas, it should be snowing — and don’t give me any song and dance about global warming, since most of this part of the globe is under a frightful winter storm. Even Malibu. So, my Frivolous Friday Friends, I’ve conjured up a little cyber-snow of my own. On Sunday, it’s supposed to get colder here, so maybe we might have weather more like Christmas soon. My skis are waxed and ready. I ran across a new iteration of the Myers-Briggs test, geared specifically for bloggers: the Typealyzer. The last time I did a personality profile (on paper, the conventional way), the results struck me as not very likely. This one, however, seems dead-on. Based on my writing, the Typealyzer categories me as ISTP — "the mechanic." That may be simply a result of what I’ve written recently; the results came back quickly enough that it doesn’t seem likely that it analyzed nearly three years of writing. But, it does explain my vehicle and recreational preferences, as well as the fact that I’m one of those who’s more likely to take on a project I can just do by myself, without a great deal of collaboration. Or, if I collaborate, I would prefer to do so with others who are similarly self-directed. I hate staff meetings. I love fixing things, making things work that previously did not. I’d much rather repair a broken motherboard than deal with a staffing issue. So, it’s Saturday. Have some fun! Since everyone’s writing about politics these days, it was thoroughly refreshing when I stumbled across the print edition of a marvelous Nashville mommy blog. The writing is excellent, the content hilarious. I’m tempted to write to her, advice-column style, about a little neighbor boy who’s been rather un-neighborly lately. He’s not actually a little boy, but a boomerang kid, who showed up on my doorstep last week to report that my dog had pooped — not the term he used — in his grandmother’s yard. Granted, we do have a leash law, and Dog is supposed to remain in my yard at all times… but, accidents happen. You know, kids leave the door open, a storm throws the breaker powering the radio fence, or the battery in Dog’s collar goes dead. It doesn’t happen often, and most of the time, someone will simply call to let me know where he is. I appreciate that; I don’t want Dog to be hit by a car. I’ve always shown the same consideration to our other neighbors. There’s a golden retriever nearby who’s so afraid of thunderstorms that he’ll run through his own invisible fence, and get into my car. Yes, the golden retriever can open my car doors. There’s another who found a way out of his traditional fence, and I just took him into the house until his owner got home… he’s not used to being out, and I didn’t want him to get lost or hurt, either. I’m quite fond of animals, and often judge people by the way they treat animals — their own, as well as others’. After complaining in person last week, the little neighbor boy called the dogcatcher the next morning, before I’d had a chance to buy new batteries and get back home with them. Fortunately, by the time the dogcatcher got to my house to leave a notice on Tuesday, new batteries were installed and Dog was where he belongs. See, if I had a Mommy Mafia like the one described in Suburban Turmoil, maybe one of them could arrange a job offer for this kid peddling magazine subscriptions in Timbuctu. Or feed him fruit gummies with perservatives and high-fructose corn syrup. Or something. After 3 or 4 martinis, the two were feeling a little less somber. There were some laughs and more martinis. They were eventually approached by some of the woman’s old friends, who were curious as to what the two were celebrating. The woman told her friends they were drinking to her impending end. ‘I’ve been diagnosed with AIDS.’ The friends were aghast and gave the woman their condolences. The last few dog days of summer are upon us: it’s hot, there’s not much going on, and no one’s writing much (including myself). In contrast, I have been reading a great deal. The current fiction favorite is Eclipse, the third in the Twilight series by Stephanie Meyer. Goofy as it sounds, we bought three copies on Tuesday; none of us wanted to "wait our turn" while someone else read ahead. This afternoon, I skimmed an interesting article in Psychology Today. There are a number of humorous (and quite possibly accurate) conclusions, but the notion that the reason that Islam produces more suicide bombers because too many of their young men "aren’t getting any" cracked me up. As good an explanation as anything else I’ve heard, I guess. Because we’ve had a week of temperatures in the upper 90’s, my air conditioner is barely working (so it’s usually in the mid to upper 80’s in the house), and the dryer’s been broken (fixed for real today, thank you HWTFM), I’ve stayed away from reading much news. I don’t want or need depression. That said, it’s worthy of note that the Perseid meteor shower peaks Sunday night (yeah, it’s a school night, but it’s educational) and should be just brilliant since it coincides with the darkness of a new moon. Not much controversy here, but maybe September will banish the writer’s block that has settled over the valley these past few weeks. Listening to the music of my youth on my little gadget — Heart, Genesis, Styx, the Eagles, Kansas, etc. — and having 14-year old Gamma remark that these oldies are better than the current stuff. BTW, all of those tunes were purchased; I don’t want to hear from Whitey McNoDownLoady, even though I do tend to agree with AT that the industry needs to update itself and that peer-to-peer sharing is nothing more than the "geeky man’s civil disobedience." For some of us, it’s even more innocuous: if I already own the vinyl, why can’t I have it in a format that works on the different entertainment-delivery devices that I use? In a single day at the pool, Gamma deepened her tan to surpass that which I’d acquired (unwillingly, by the way) over three weeks of campaigning in the sun. She has her father’s skin. Speaking of entertainment, there’s an excellent bit of cinematic art posted on YouTube by a young lady who hits at the heart of what’s probably the only thing wrong with Oak Ridge. Watch, and think about it. Beta came home last night with a scary tale of an incident suffered by one of her schoolmates: a young man she knows (an ORHS senior), went outside to bring in his cat, and a coyote jumped him, scratching his shoulder and chest in an attempt to take the cat from him. If true (this came via my teenager and I haven’t confirmed it anywhere), this pokes a big ol’ hole in the argument that coyotes are no danger to humans, as presented by one side of a publicized neighborhood discussion about the coyote problem in Country Club Estates a couple of months ago. This incident was nearby, but on the north side of the turnpike. The Tennessean has a very interesting piece of black history from yesterday (hat tip: VolunteerVoters). I’d have never guessed; I don’t think I’ve ever seen anything like that in the various black history month things from school. Another Ford made the news (again). Funny, just yesterday, I told a couple of friends at lunch that my primary discomfort with Harold Jr. is his family. I know he says he’s different — I even want to believe that he is — but it’s not just a case of one rogue relative. There are so many. Terry Frank has been doing some homework; although there are plenty of areas where Terry and I disagree, this is a story that needs to be heard. For example, Heather Tang, an Oak Ridge mother of three, said she spends at least $200 a week at the Turkey Creek Target, buying a variety of items including clothes, food, and diapers. “I would much rather spend it in Oak Ridge than drive over to Knoxville,” Tang said. Some of the critics have challenged the revenue estimates on the basis that Oak Ridgers can’t spend that much more, but the quote above precisely illustrates the counter-argument: it’s not that we will spend more, but that we will spend more here instead of elsewhere. I changed lanes, getting behind an elderly lady with more than 20 items, but figured it would still be faster than waiting for the fishbowl. It wasn’t — I don’t think this lady has anyone to talk to, so she chatted and chatted with the polite 20-something young man at the register (about her tractor, how last year’s drought affected her greens, that it’s time to plant this year’s greens but they need rain at a certain stage, and on and on). It was apparent that he didn’t know her personally, but had spoken just enough to get her started. Even when her order was finished and she had her receipt in hand, she stood and continued chatting. Even when MY four items were rung up and totaled, she stayed and kept chatting — keeping me from reaching the card reader so I could pay for my stuff and get out of there. If Target has a self-checkout, it will be well worth driving the extra three blocks.